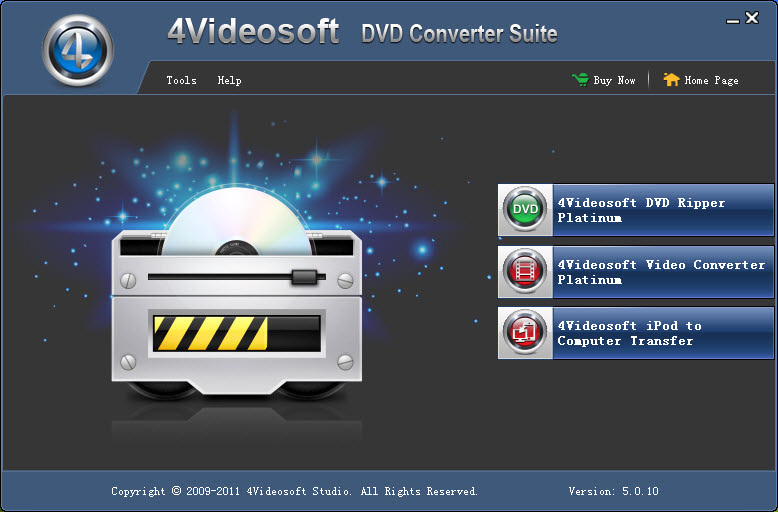 4Videosoft DVD Converter Suite offers DVD Converter and video file converter. It can convert DVD and video to AVI, MP4, MPEG, WMV, 3GP, HD video, MP3, WMA, etc with super fastest conversion speed. Moreover, it provides you more editing features, such as trim DVD movie/videos, crop and merge files into one, snapshot picture, watermark, even set the DVD movies and video effect, etc. Plus, it newly supports iOS 5.0.1 and iPhone 4S. Convert DVD to AVI/MP4/MPEG/WMV/3GP/HD video/MP3, etc with super fastest speed. Moreover, 4Videosoft DVD Converter Suite provides you more editing features, such as trim DVD movie/videos, crop and merge files into one, snapshot picture, watermark, even set the DVD movies and video effect, etc. All the editing functions are designed for your preference. Plus, it newly supports iOS 5.0.1 and iPhone 4S. And it Adopts NVIDIA? CUDA? and AMD APP GPU Processing acceleration technology. 4Videosoft DVD Ripper platinum is capable of converting DVD to any popular video and audio formats, like MP4, AVI, WMV, AAC, etc. The Video Converter Platinum enables you to convert all videos such as AVI, MPEG, H.264, MOV, M4V, and HD videos to any other video and audio formats for your enjoyment. You can also use this DVD Converter Suite to extract audio file from any DVD and video to save as AAC, AC3, MP3, M4A, MP2, WAV, WMA audio formats. Pavtube DVD Converter Suite: video converter and dvd ripper integrated. Pavtube Video DVD Converter Suite: video converter and dvd ripper integrated. Qweas is providing links to 4Videosoft DVD Converter Suite 5.0.18 as a courtesy, and makes no representations regarding 4Videosoft DVD Converter Suite or any other applications or any information related thereto. Any questions, complaints or claims regarding this application 4Videosoft DVD Converter Suite 5.0.18 must be directed to the appropriate software vendor. You may click the publisher link of 4Videosoft DVD Converter Suite on the top of this page to get more details about the vendor.